Health Insurance for Pets? Hell, Yes! | Will My Dog Hate Me? Health Insurance for Pets? Hell, Yes! Pet health insurance is one of those topics that pushes buttons with people who think that pets are overindulged — you know, like the executors of Leona Helmsley’s estate who decided that they knew better where her money should go after she died than she did. Human health insurance is a hot button topic these days too, of course, and the two issues are integrally interconnected. As I write this post, I have in front of me a bill for Frankie’s recent bout of “being a dog” — the diagnosis the vet ultimately came up with. I brought him in on a late Friday afternoon because he was throwing up endlessly. This was particularly problematic because of Frankie’s diabetes; I can’t give him insulin on an empty stomach. The vet gave him a quick exam, some in-house blood tests — again, because of his diabetes, major problems like pancreatitis were a possibility — and an anti-emetic shot. I brought him home where, instead of throwing up, he issued the rest of his stomach’s contents via his other end. He was in and out of the backyard all night long, poor little guy. By the morning, he was exhausted and still not eating. The result: Another visit to the vet, more tests, an IV hook up (including insulin stabilization), and an overnight stay at the veterinary clinic. He began eating the next day, and was sent home with antibiotics. So, that’s a total of $743 (a bit less if you deduct the $60.60, my standard insulin payment earlier in the month). I’m a little concerned about the “re-check exam” and its overlap with the geriatric exam and the exam of the previous day, but that’s another issue. As everyone who reads this blog knows, I was extremely relieved that Frankie recovered well and that his problem wasn’t associated with his diabetes. And I know it could have been worse, that had I taken him to the emergency vet, the costs would have been about double, and I wouldn’t have had the assurance that came with going to a vet who knows Frankie and his medical history. 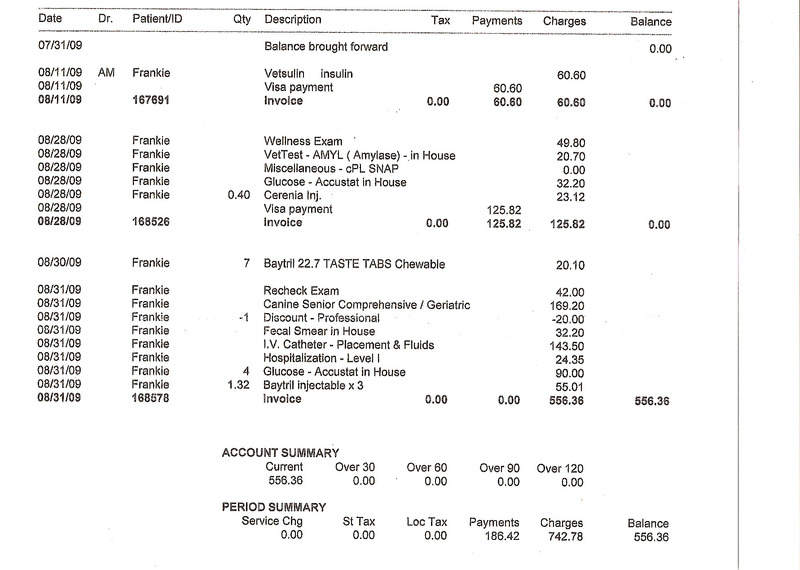 Am I happy to have racked up this “reduced” vet bill? Not bloody likely. 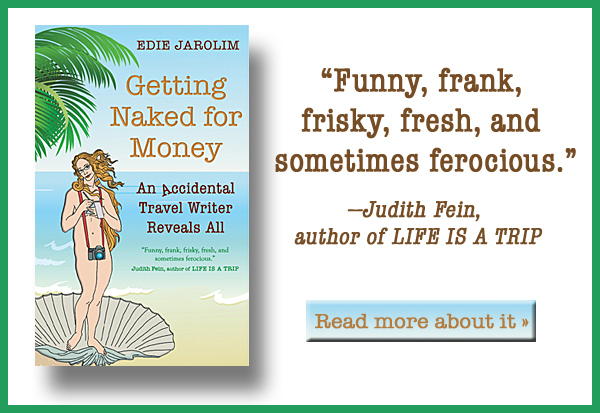 Business is bad for everyone these days, and freelance writing is no different. Every day, another newspaper and magazine bites the dust. I was kinda, sorta catching up nevertheless when this hit me. This and, not so coincidentally, a letter from BlueCross/Blue Shield of Arizona stating they were raising my health insurance rates — not because I was moving into a new age category or anything, but because…. well, because they could. If I wanted to keep the same (still high) rates, I could raise my deductible from $5,000 to $10,00o dollars. What an option! Did I mention I haven’t gone to the doctor this past year because I’m feeling fine and I know that I’m inevitably going to get hit with all kinds of extraneous costs — aside from the $35 co-pay — for a “wellness” exam: Cholesterol tests, bone density, etc. I regard my health insurance as an emergency fallback, so I won’t go into debt if I need to be hospitalized. Pet health insurance is not yet broken, like human health insurance is. (Yes, I want a public option, all you loons out there disrupting town hall meetings. I want it bad.) My long-distance pal Susanne, who shares her home in Australia with a diabetic Alaskan malamute, naturally worries about her dog, Jasmine’s, health. In contrast to me, however, Susanne doesn’t worry about the vet bills: She has pet health insurance. I’ll talk more about the various pet health insurance options, including what you should look for and what you should look out for, in my next post. This one has gone on a bit longer than I’d planned. I will try not to moan over the fact that I didn’t know in advance — that is, before he turned 9 and developed diabetes — that it was a good idea to get Frankie insured. If you can set aside money every month, then ON AVERAGE, you’d be better off to forgo pet insurance. But if you’re afraid that your pet might have more than the average veterinary bills, or if you just don’t set aside the money, then pet insurance is a wise choice. As you mentioned I fortuitously have pet insurance for Jasmine. When I purchased my fluffy pup I knew she was going to be a very large girl when full grown, which would equal extra big vet bills if something went wrong. I had never had pet insurance previously, but fortunately decided to take it up for Jas, & have come out way ahead now with the ongoing claims I make for her diabetes. So understandably I am a big advocate of insurance. It is great that you are also going to do a post about choosing a plan, because not all policies are equal, and the fine print, boring as it is, definitely needs a careful read before signing up to a particular company. I look forward to seeing the next instalment. Susanne, do you think the options in Australia are a lot different than those in the U.S.? I’d love it if you would share what you looked for and discovered in doing your research about insurance. Yes, I’m asking you to do a guest post; I would love to have someone with first hand experience in choosing a pet insurance company to detail that process, without naming names of companies of course. What say you? Notice that I’m asking you in “public” rather than via private email where it would be so much easier for you to refuse! I’ll tell you what, Susanne. I’ll post what I planned to about insurance tomorrow — today it’s an interview with Frankie that a friend did — and you can respond with your personal experience. Sound like a plan? And, yes, be very glad you live in a country where people aren’t irrationally afraid of public health insurance! Pingback: Will My Dog Hate Me? » Blog Archive » The cost of dog care: Where do you draw a line? I agree, and my take on pet health insurance can be found at Pet News and Views.